As described in our "About the UK" section, the UK is made up of four parts: England, Scotland, Wales and Northern Ireland. Although it is all one country, there are many distinct regions with varying accents and cultures. For such a small country, it has so much diversity! What is Scotland like to study in? How is the weather in Cornwall during the summer? Can I easily travel around the UK? Can I get a bank account? Make sure you can locate the UK’s major cities and that you can distinguish between Wales, Scotland, England and Northern Ireland - plus what to expect weather-wise during the year. The most common stereotypes that people have about a nation often are not true, and the UK is no different. Learn a little about British Culture and the people. What type of accommodation are you going to encounter when you come to the UK? Dorms, homestays, a private flat? You will have many options available, which will be best for you? 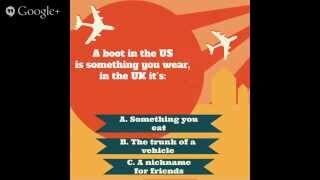 The UK, being a small country, has many transportation options - some cheaper than others but what is the best way to get around? "Look after your pennies, and the pounds will look after themselves" so the old saying goes, and this section will help you look after your pennies in the UK. Probably one of the most important sections about the UK, learning more about your visa, who needs one and what to do to get one!